Fan death: Korean moms think that your electric fan will kill you. Is Your Electric Fan Trying to Kill You? “Is it really true that if you clip your fingernails while your relatives are flying somewhere,” the radio producer asked, “their plane will crash?” I was being interviewed about my new book, Because I Said So!, which fact-checks 125 classic parental clichés: breakfast is the most important meal of the day, don’t sit so close to the TV, don’t swim right after you eat. You get the idea. During the commercial break, a producer asked me about this particular bit of wisdom, passed along by her mom. I took a long look at her; she seemed to be in dead earnest. “Where does your mom, uh, happen to be from?” I asked as innocently as I could. I told her I’d never heard that one before—maybe it was more of a Slavic thing. I wasn’t surprised at all to find out that Mom, in this case, had been raised outside the United States. In writing the book, I’d spent the past two years soliciting parental nags from friends, acquaintances, and Internet strangers, and I’d learned very quickly that these bits of folklore tend to be extremely culture-specific. A classic Mexican momism might bear no more resemblance to a Scandinavian one than huevos rancheros do to lutefisk. In China, for example, it’s widely believed that sitting on a seat recently warmed by someone else’s behind can give you hemorrhoids. The Brits, on the other hand, attribute hemorrhoids to sitting on cold surfaces. But sitting on that same cold concrete would lead to a different lecture from a Ukrainian mom: She’d be sure it would make you sterile. Some Peruvians are told that lingering too long in front of the fridge can cause cancer. In the Czech Republic, everyone knows that drinking water after eating fruit leads to painful bloating. Filipino kids can’t wear red when it’s stormy out, since that would attract lightning. Germans and Austrians live in mortal fear of drafts, which get blamed for everything from pneumonia to blocked arteries, so summertime commuters routinely swelter on 90-degree trains and buses rather than cracking a window through which a cooling—but lethal!—breeze might pass. In South Korea, however, the concern about ventilation is exactly the opposite. Koreans will only use electric fans if a window is cracked, because leaving a fan on in an enclosed room, it’s almost universally believed, can be fatal. The mechanism behind the threat is a little vague: Sometimes it’s said to be a lack of oxygen that kills you, sometimes it’s a chill. But either way, you won’t care. You’ll be dead. I actually grew up as a child in Seoul, South Korea, and fans were no laughing matter. Everyone took the Great Fan Menace for granted and had a hard time believing that other cultures were ignorant of it. An apartment of Americans I knew teased their lone Korean roommate by going to bed one summer night in an enclosed room with six electric fans turned on. He pleaded with them not to throw their lives away and slept in the hallway. When, in the morning, all three had survived the ordeal, the Korean roommate was still not convinced. Obviously, he said, they had been playing a practical joke on him and had cracked a window as soon as he was out of the room. Back then, fan death was an obscure curio known only to Westerners who had spent time in South Korea, but today the Internet has spread it worldwide. “Fan death” has its own lengthy Wikipedia entry and has become a beloved comedy meme on websites like Reddit. The popularity of the Korean fan death meme probably arises from its central irony: that one of the world’s most technologically modern countries has hard-to-explain issues with a simple mechanical device invented in the 1880s. But sometimes the world’s new obsession with fan death veers into crypto-racist sneering at the oddball, backward Asians. One of the first Web pages to publicize Korean fan-xiety was FanDeath.net, on which “Robin S.,” a Canadian who moved to Seoul in 1999 to teach English, marveled at “the lack of critical thinking” displayed by the “loyal natives” he confronted about the issue. This casual Western contempt has led, charmingly, to the rise of fan death trutherism. “Fan death is real,” announces “T. K. Park,” a Korean-American Washington, D.C.-area blogger, on his popular “Ask a Korean” blog. Park wasn’t a fan-death believer himself, not at first, but—annoyed to see his culture becoming an Internet punchline—he started researching the subject and was surprised to find that U.S. government agencies like the Environmental Protection Agency and Centers for Disease Control have also recently come out against electric fan use in enclosed rooms. Could Koreans actually have been right all along about fans? Kalkstein was invited to Korea in 2008 to brief its meteorological administration on heat warning systems, and while there he told a curious reporter that yes, people should be cautious about fan use in enclosed rooms. His unwitting support of fan death made the national papers, and today he’s careful to explain that his guidelines and the Korean “fallacious belief” differ substantially: Fans only require caution under certain conditions, and the effect would have nothing to do with asphyxiation or hypothermia. It’s tempting to equate fan death with the other old wives’ tales I wrote my book about. But fan death is a little different. 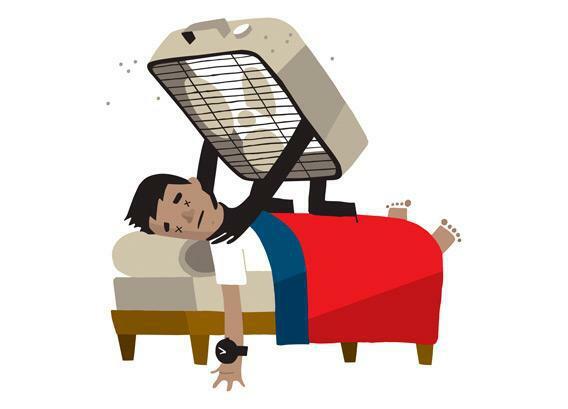 Notably, it’s backed up by Korean medical authorities and even the South Korean government, which as recently as 2006 called fan death “asphyxiations” one of the nation’s most five dangerous summer hazards. Internet conspiracy lore sometimes blames the legend on a 1970s-era government campaign to conserve electricity, but in fact these warnings are generations older, dating almost back to the introduction of electric fans to Korea. A July 31, 1927, story in the now-defunct Jungoe Ilbo (“Domestic and International Daily”) raised the specter of “Strange Harm From Electric Fans,” including nausea, asphyxiation, and facial paralysis from this “new technology.” “The rotating fan blades create a vacuum directly in front, and the intensity of the resulting air flow always results in an insufficient supply of oxygen to the lungs,” the newspaper warned. To this day, many fans sold in Korea come with stern warning labels and even timer knobs for automatic shutoff. What led to this early fear? Was there some ur-event, some single death mistakenly attributed to an electric fan, that kicked off the whole thing? That’s what happened with poinsettias in America, which are still widely (but incorrectly) believed to be toxic due to one misdiagnosis by a Honolulu physician in 1919. But in any case, once the belief took hold, it was persistent. Hierarchy and deference to authority are important in Korean culture, which can make myth-busting a challenge. But not impossible! A recent email survey of contacts in Korea suggests to me that, among the younger generation anyway, the fan-death consensus has recently gone from “Of course!” to “Can you believe my parents used to tell us that?” A decade of Internet skepticism seems to have accomplished what the preceding 75 years could not: convinced a nation that Korean fan death is probably hot air.